England’s Peak District is a beautiful area of wild moorland and wooded valleys; but it’s also a graveyard for over 50 aircraft – mainly Second World War planes that crashed in poor visibility on the western edges of the Peak’s bare moorland. These tragic remains now attract ‘baggers’ in the same way that the Scottish mountains do and there are many websites and even books listing the wrecks and their precise positions in the often featureless landscape. I came across my first wreck by accident, while trying to find my way over a desolate stretch of moorland in the area around the Black Hill in the far north of the Peak District. First, I came across single pieces of metal (1), shredded and twisted, and then, following their trail, I found recognisable parts of aircrafts – bits of wing, engine and fuselage – heaped together in a shallow gully. Finding this wreckage suddenly invested the landscape with a enigmatic sense of tragedy – an unknown story that obviously involved violent death. 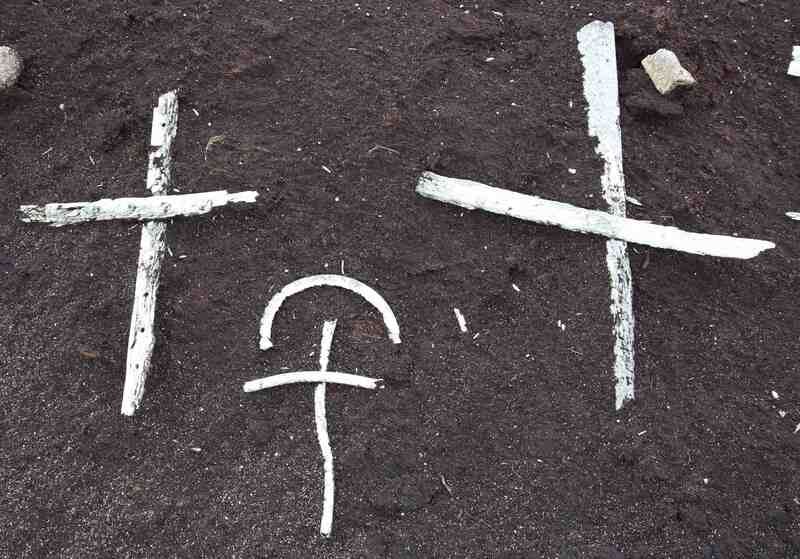 More striking was the discovery of a small memorial – a cross and a poppy – embedded in part of the wreckage (2). 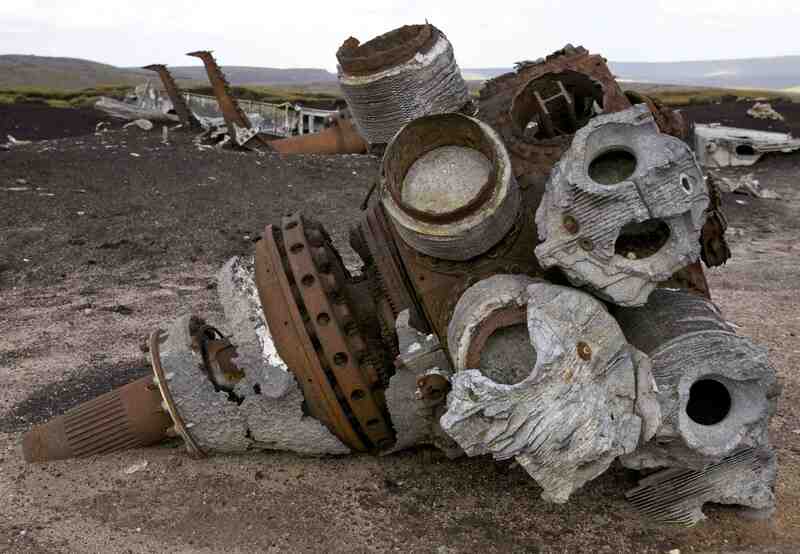 After returning home I found out the story of the wreckage: two Meteor aircraft had collided in mid-air in 1951 and crashed on the moorland, killing both pilots. 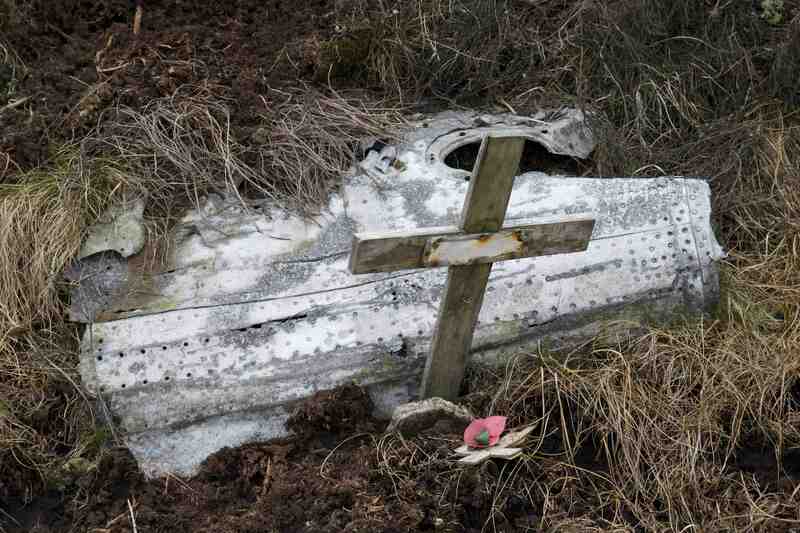 Many of the Peak District’s aircraft wrecks are also memorials. 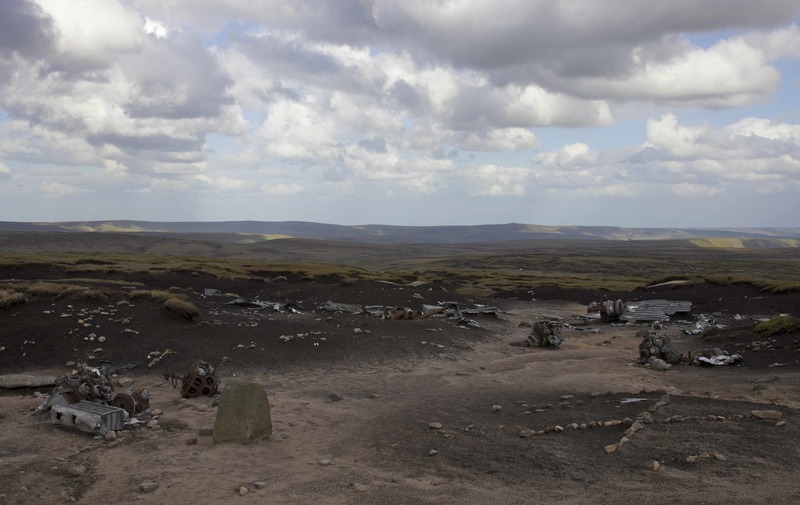 A much larger wreck at Higher Shelf Stones near Glossop is very close to a popular walker’s path and it consists of the ruins of a B-29 aircraft, which crashed in 1948 killing all 13 people on board (3). 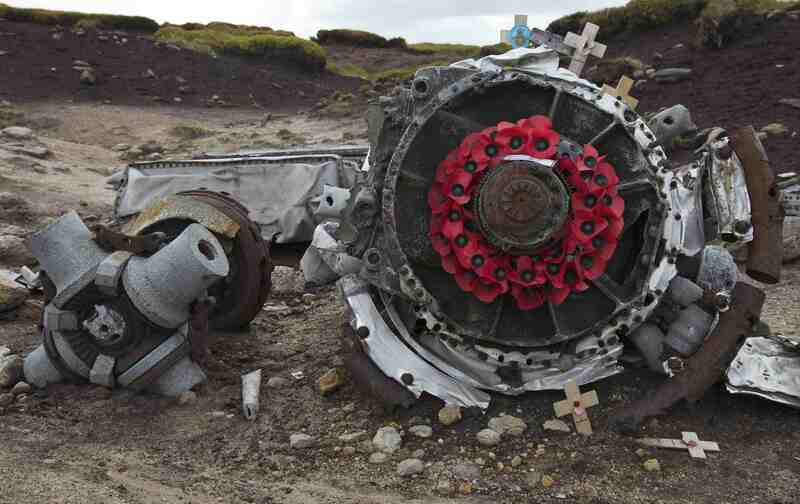 Amongst the wreckage – including almost intact engines, wings and wheels – are countless memorials, made up of a mixture of crosses, using stones gathered from the moor (4), bits of wood or even parts of the wreckage itself, and poppies arranged around the engine parts in scarlet wreaths (5). The iconography of these memorials is the same as those used for war memorials and many of the aircraft were used during wartime or carried veterans when they crashed. Yet, the effect of this iconography amongst these wrecks is very different from its more common counterpart – that is, cenotaphs and poppy-wreaths that form the focus for acts of civic remembrance. Here, unchanging ceremonies present the past as if it were static, undisturbed by the erasing nature of time and the duplicity of memory. 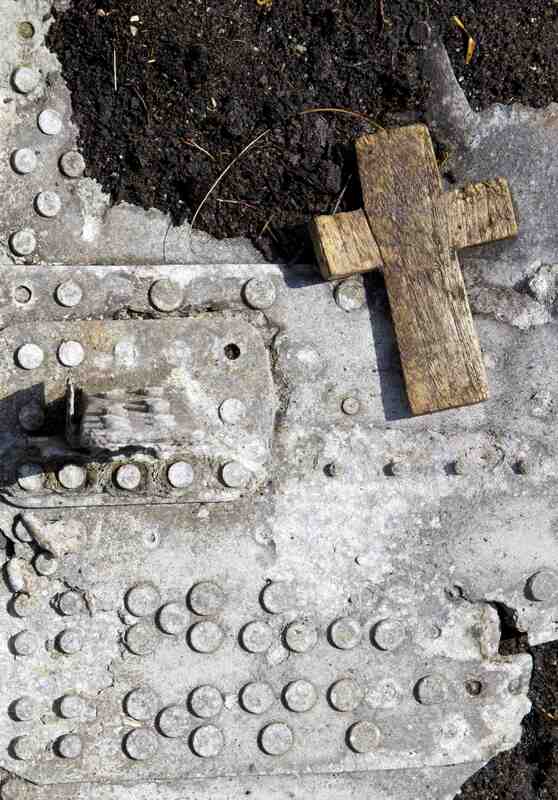 In these Peak wrecks the memorials become part of the ruin: wooden crosses are scattered by the wind (6), poppies devoured by rain, stones sunk into the bog. As such, even as they bring to mind past lives obliterated by a violent event they also participate in the inevitable process of ruin itself. We might even argue that the wreckage itself is a more powerful memorial than the later additions. 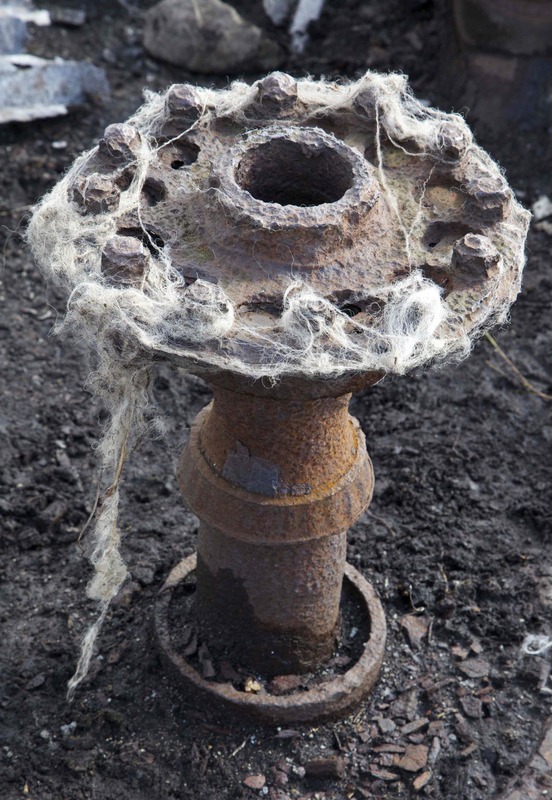 Left where it fell in the landscape, it is overtaken by nature: the metal surfaces become strangely contorted by rust and weathering (7), moss and grass grow through the pierced surfaces, and sheep make use of hard surfaces as convenient places to relieve an itch (8). In its ruined state, this wreckage speaks both of a past event – one that is tragic and violently immediate – and of its subsequent return to a much slower time, where it accumulates the stories of the landscape itself. This is gorgeous work, and relevant analysis. My favorite photo is the crushed radiator. Those myriad tubes excite something inside me. 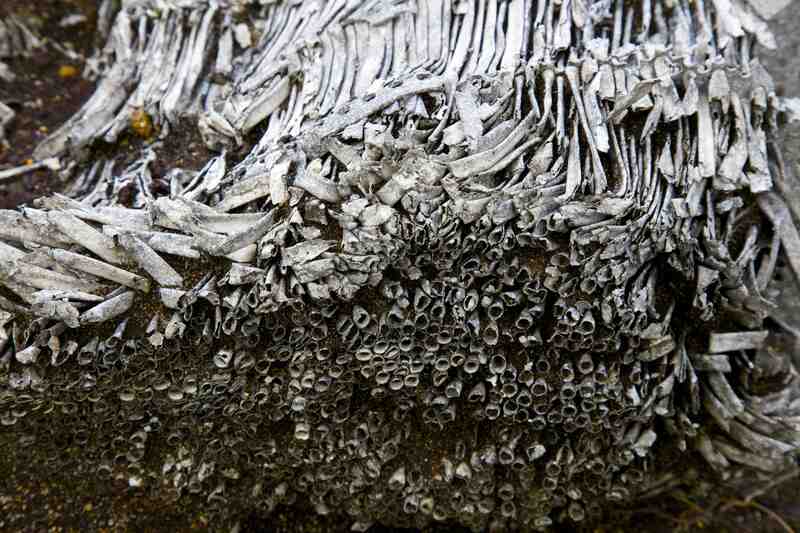 I think it is the unknown scale of the photo — we may be looking at capillary tubes or maybe human-sized access ducts. Thanks for your comments Eli. I like playing around with scale in my photos and these sites are great for that – big landscape and often-tiny fragments of objects. Paul – you might be interested in Rod Holt’s work: http://www.rodholt.co.uk/gallery/overexposed.htm . 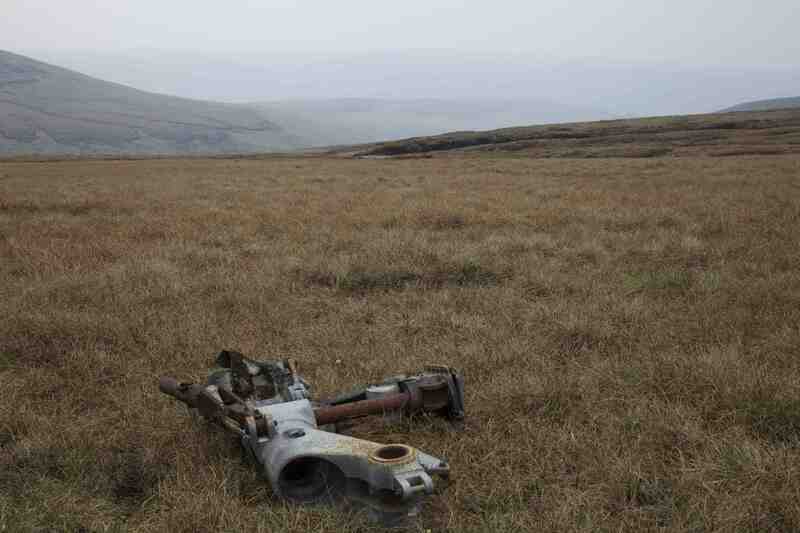 The wreckage is pretty legendary in my neck of the woods (Glossop). Thanks, Jenna. It’s very close to the path up there & obviously many walkers see it. It’s also one of the largest wrecks in the peaks I think.